Guy Sebastian going through his 'Get 'Em Girls (feat. Snoop Doog)' phase? 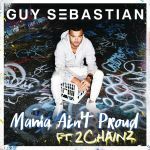 :P<br><br>This is such a strange single coming from Guy Sebastian, but I actually prefer this to 'Come Home With Me', and even 'Like A Drum'. Netter Song, stört mich nicht, begeistert aber auch nicht. Gute 4* liegen drin. I didn't like the idea of Guy collaborating with 2 Chainz and I think I'll stand by that after listening to the song.<br><br>The song itself isn't that bad, but it just all feels a bit strange to me. There isn't much here I would usually like, but I don't dislike it. What I'm saying is that it is hard for me to explain why I really feel about it.<br><br>2.5*. A contender for worst Guy track ever. 2.9. This existing is bizarre and I find it strange to listen to. I can't buy Guy in this role and I don't particularly want to as the song isn't enjoyable anyway. The reason why it's so strange is because Guy's parts sounds like a completely different song to 2 Chainz's parts. Definitely no good. Das Spannendste für mich an diesem Song war eigentlich, herauszufinden, an welcher Stelle man sich das Konzept welches Songs abgeschaut hat. Damit hätte man nur schwer beim ESC teilnehmen können. Ansonsten viel Geplapper um wenig Inhalt.<br><br>Ich denke, eine knappe 3 ist dennoch verdienter als zwei Punkte. Ich finde eine 2 ist genau richtig für so eine schwache Nummer! First time I've heard this. I never want to hear it again. Guy is the best thing about it but unfortunately he can't save it from 2 Chainz's hot mess. And that awful guitar sound in the background that is so obviously out of place. No thank you. Das Beach Boys Teil zwischendurch ist ganz nett. Auch der Refrain ist okay. Der Rest ist wirklich chaotisch und nur mit guten Nerven zu ertragen. As weird as it may sound, this song actually gave me some hope. After "Like A Drum" and "Come Home With Me" I expected the album to be full of that type of stuff that I've grown to dislike and I was pretty much ready to give up hope on the album being any good. But along comes this track unexpectedly and makes me have faith that the album was going to have some variation. Luckily the album is actually good and not like I feared. Back to this though, I can't help but laugh at the existence of this. I mean Guy collaborating with 2 Chainz on a trap track? Nothing I ever imagined would have happened. And unsurprisingly it's quite a trainwreck. Guy and 2 Chainz's parts indeed don't fit well and the song seems like an odd mish mash of numerous ideas (that surf rock guitar, I just don't know why that's even in there). That said, I do find all that pretty amusing, but it's not good at all so I can't give it more than what I've got here. At the very least it's more interesting and less generic than "Come Home With Me".